From the makers of the original Dots game, as well as the sequel TwoDots, Dots & Co is what I would label as a more adventurous take on the same Dots gameplay. While you still go around popping dots and making squares for more points, there is something similar to what could be labeled as a storyline taking place in Dots & Co.
We begin Dots & Co with a single character, making her way through a very dotty world. As we progress, we meet companions. These companions have special traits, such as the ability to clear an entire color of dots, making select levels a bit easier. However, even with the addition of actual characters, it’s basically the same Dots game as the original. In Dots & Co, there is a timer-like system based on Energy, just like Candy Crush. If your energy runs low, you can’t play and you’ll need to wait in order to play again. When you complete a level, you gain energy back. As long as you continue winning, the game lets you play on. This is where the in-purchases come in. If you run out of Energy, a full charge will cost you 12 gold coins. Interestingly enough, 10 gold coins will cost you $0.99. This means you will be two short, potentially forcing players to purchase $2 worth of gold coins. Stupid? Absolutely. From what I can tell, the game is really simplistic and not at all challenging. This means the need to purchase gold coins will hopefully never arise. With that being said, the game is actually quite enjoyable, coupled with a very fun soundtrack. 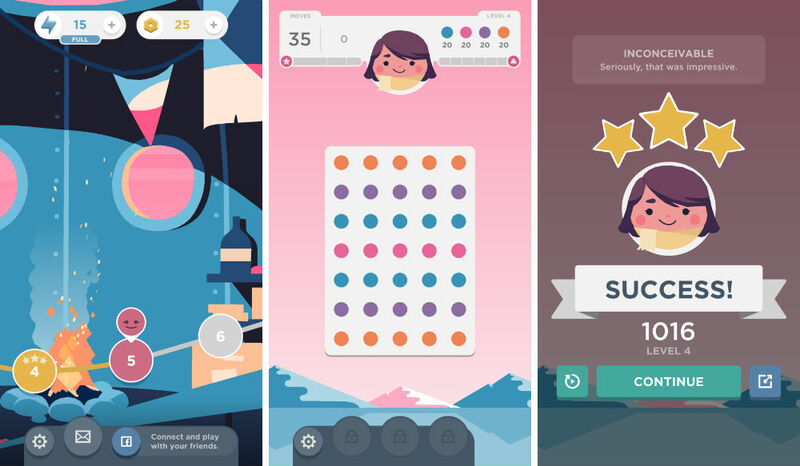 If you are a fan of the original Dots, or its sequel TwoDots, give Dots & Co a try.